Right then, it’s time to slip in to your tango shoes and dance your way to the 3 best hostels in Buenos Aires, Argentina! 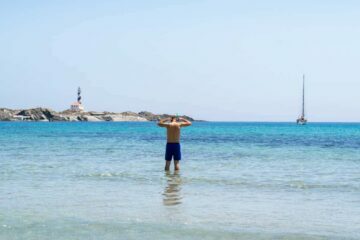 In this guide you will find swimming pools, party places and even ping pong and Maradona. 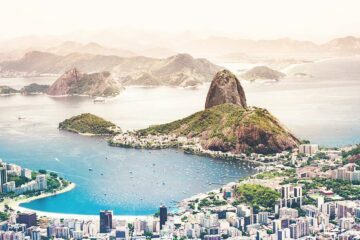 No doubt you’ve already started planning your South American trip. 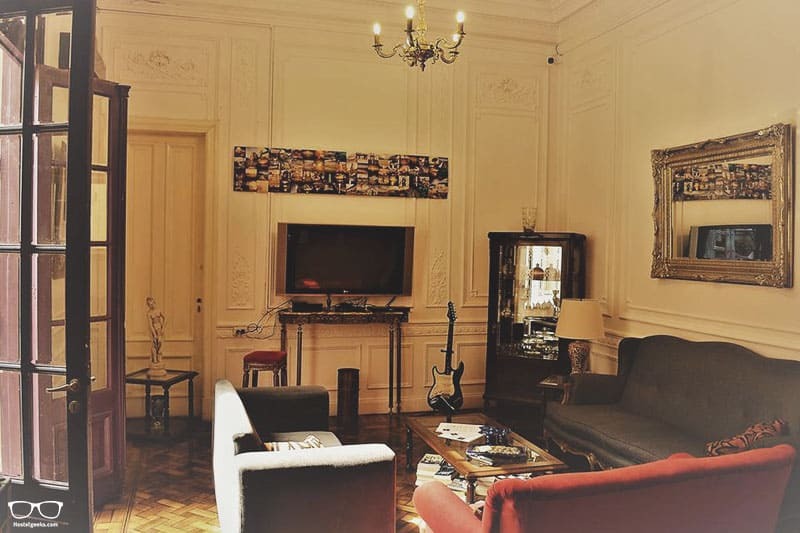 But something tells us you’re still not sure about where to stay in Buenos Aires? 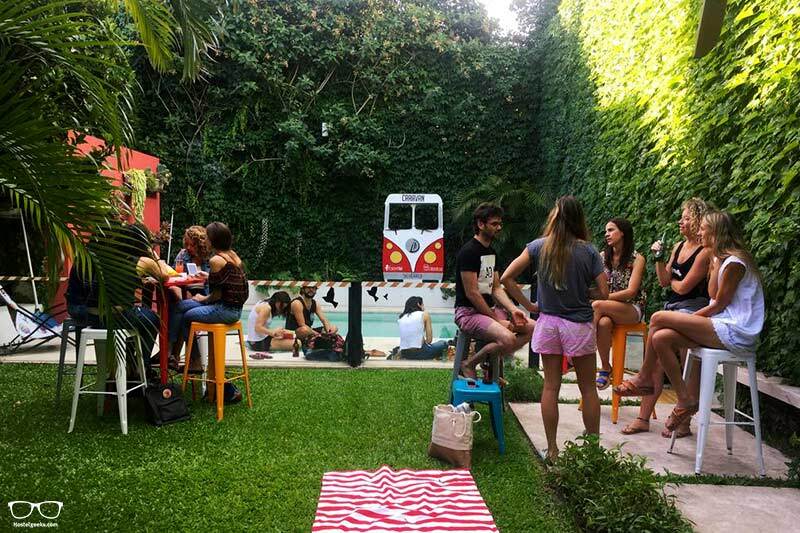 Whether you’re backpacking Buenos Aires or in search of great party hostels; Hostelgeeks has you covered. 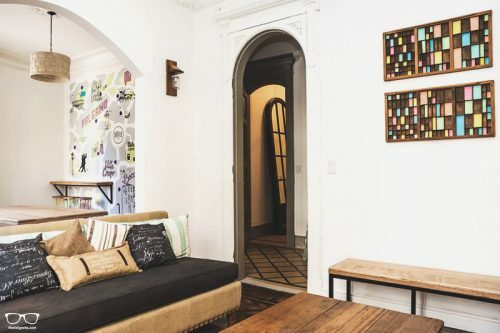 Our handpicked coolest hostels in Buenos Aires are rich in modern design, comfort and social vibes. Don’t take our word for it and check out the 25 coolest things to do in Buenos Aires. As always, we included all accommodations and sights in the map. Just keep scrolling. 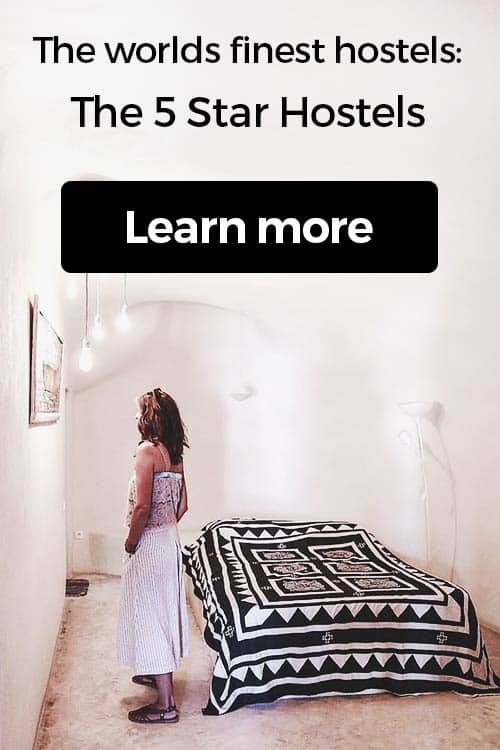 Average price for a bed: A bed in a dorm can be as cheap as 8€ up to 11€ per night. 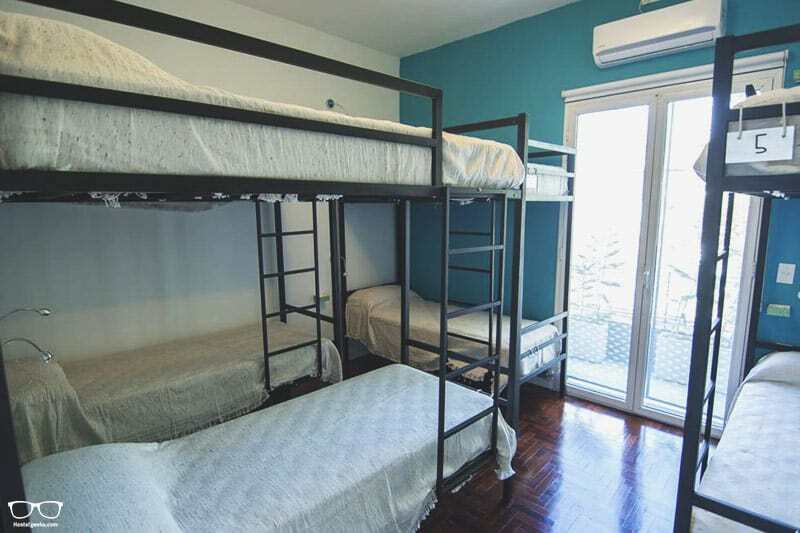 A private room in a hostel in Buenos Aires starts from 20€ up to 62€ per night. 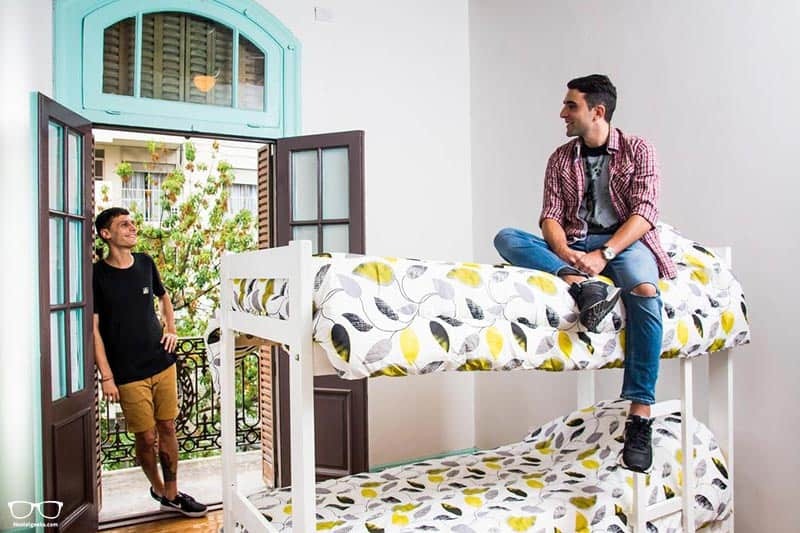 Hostel Quality: The quality of hostels in Buenos Aires has risen a lot in the last 2 years. 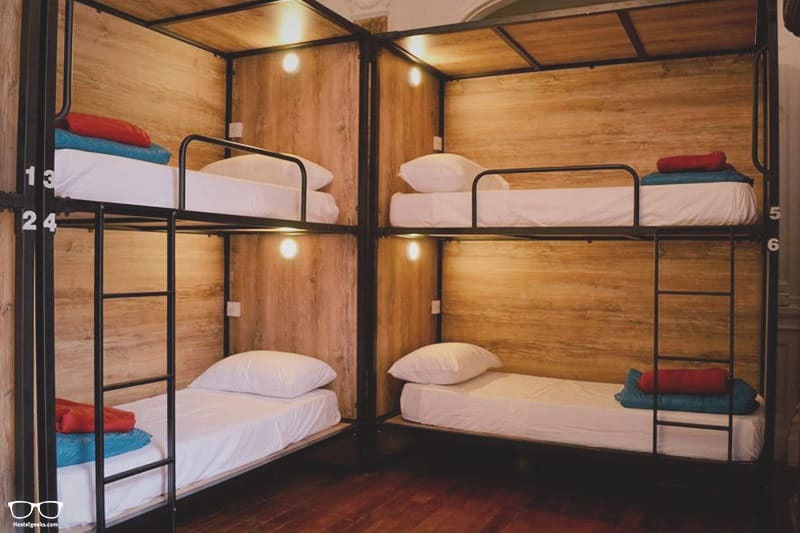 You have now really cool backpacker hostels in Buenos, and also nice Boutique Hostels. That being said, we also enjoy some B&Bs and even a few, neat hotels here. 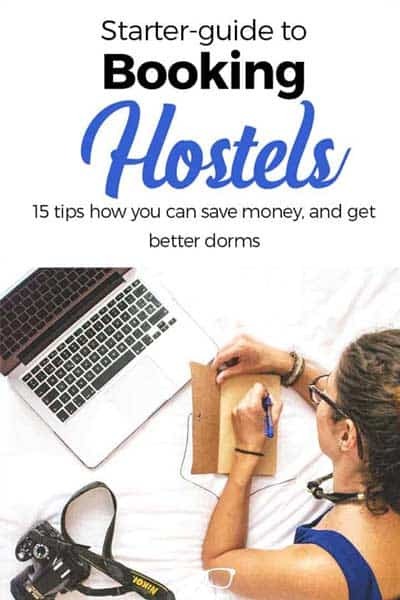 Of course, hostels are usually the more social place to meet and greet. Welcome to the cute, cosy boutique 5 star hostel known as Caravan BA. With only 28 beds here, you can expect an intimate yet quality experience during your stay. Choices include 6-8 bed dorms, single/double and triple rooms. 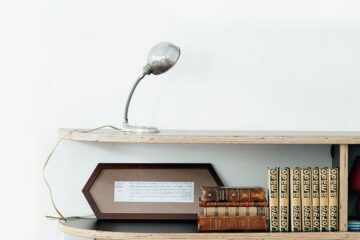 All of which come with linen and those all important home-from-home touches. There are places where you stay, and places that stay with you. As expected of any great hostel, Caravan BA has optimum space inside and out to relax, work and play. Chill out with a movie in the living room, or rustle up a treat in the fully fitted kitchen. Wake up and follow the smell of fresh bread to your free morning buffet breakfast. It comes with traditional sweet Dulce de Leche – yum! If that’s not enough there are weekly events including pizza nights and bicycles for hire. Located in Palermo Soho, you’ll be surrounded by 50+ cafes, 40+ bars and the nicest parks in the city. There’s still so much more to discover. 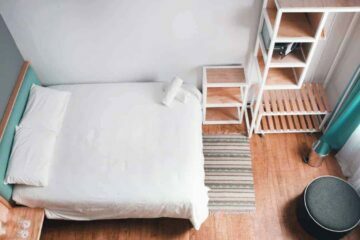 Benita Hostel, a fully renovated and charming 19th- century house, is located in the popular area of Palermo. Rest assured with high quality mattresses, comfy duvets and pillows (ready made) and a ceiling fan. The room lockers are also super spacious! Although there are plenty of restaurants nearby, you may want to make use of the fully-equipped, modern kitchen. This is also where you can enjoy your free breakfast to kick-start the day. At Benita you really get the communal vibe; the social area is completely integrative, consisting of a dining/drinking area, sofas and a TV with Netflix. If you want to socialise, you’ll almost certainly become part of the Benita Family. It’s the ultimate space for socialising and/or relaxing in your own company. If you’re looking for bright and spacious accommodation with trendy boutique design, Meridiano Hostel Boutique is the choice for you. 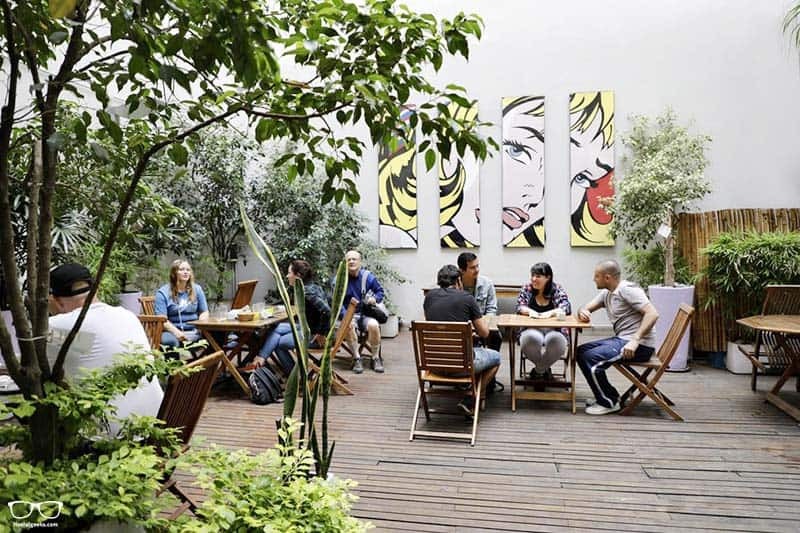 Once again Meridiano is located in the Palermo area of Buenos Aires, so you’re never too far from awesome nightlife and balcony infused cafes. Each room has its very own private bathroom, and some come with a balcony with garden and city views. Possibly the main attraction of this hostel is the in-house bar. Enjoy a drink amongst the lively atmosphere and get chatting to other travellers. It’s also located on a rooftop terrace – perfect for sunset! The staff here want to make your stay memorable. The front desk is open early ’til late so there’s always a chance to pick their brains. 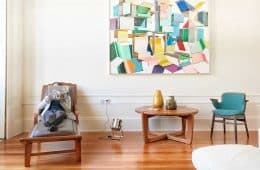 Travelling solo and searching for where to stay in Buenos Aires? We’re here to help with just that. As always we’ve taken that extra leap to bring you yet another option. If you’re a solo traveller that enjoys historic buildings then America del Sur Hostel is a good choice. Located in the Monserrat neighbourhood, iconic buildings and primary interests make up the area. 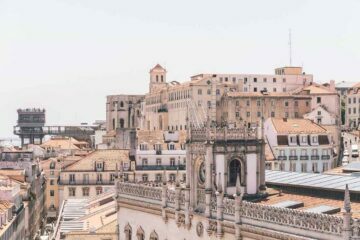 It’s away from the tourist hub of Palermo and offers a much more ‘local’ experience. 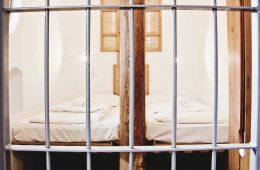 There are mixed and private rooms available to choose from, all of which have their own bathroom and air-conditioning. If you’re feeling sociable join one of the free walking tours, or have a chill day in front of the TV with a coffee. 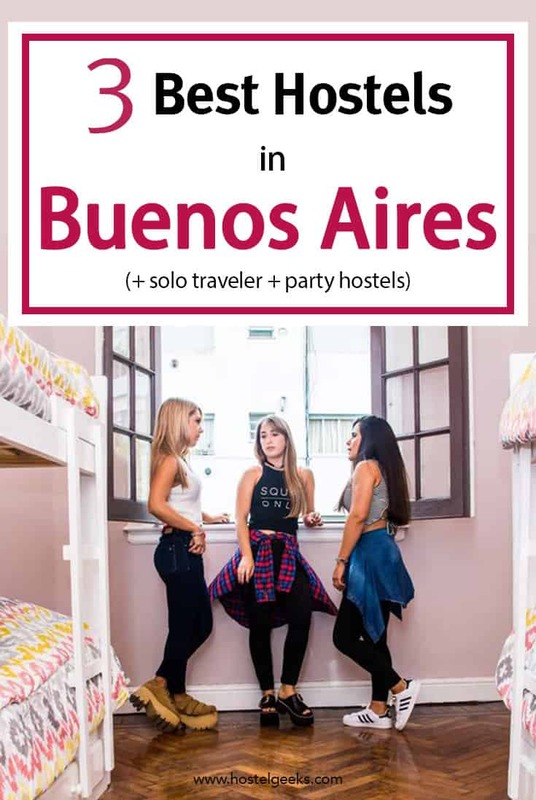 It’s time to check out the party hostels in Buenos Aires for those looking for a fun, lively time with new friends. 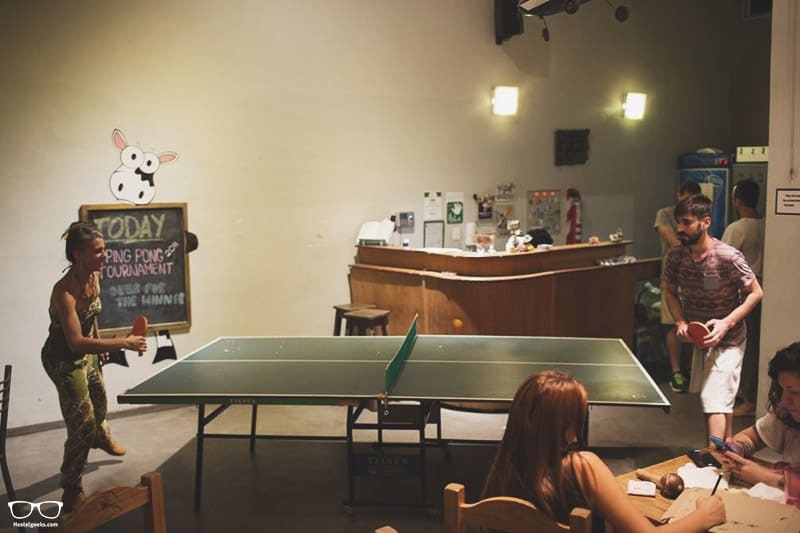 We’ve actually narrowed it down to the best party hostel in the city: Milhouse Hostel Hipo. 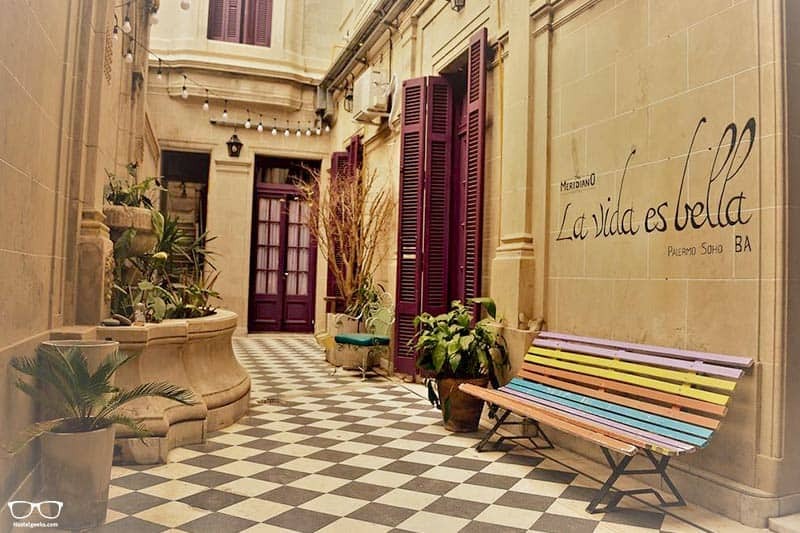 This 19th-century colonial building has been transformed in to a lively and fun hostel with groovy facilities. 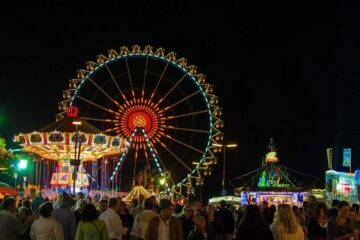 Join in arranged activities, BBQ feasts and numerous parties. It’s THE place to meet people! 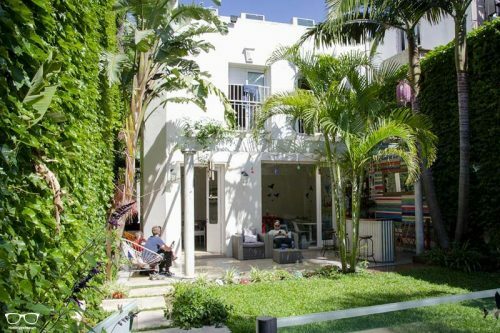 Super cool: stay a minimum of 4 nights, show your Australian passport, and pay for only 3. Backpacking Buenos Aires is popular and for good reason. 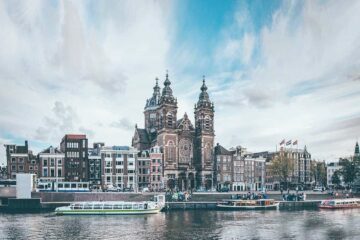 It is cheaper than say European cities and getting around is easy thanks to the numerous public transport options. As a lovely all rounder designed with experienced travellers in mind, we recommend Sabatico Travelers Hostel when backpacking Buenos Aires. Dorm rooms are intimate with 4-5 beds and there are private options, too. It’s all possible at Sabatico! There’s also a low cost gourmet breakfast (including pancakes) on offer, foosball and well-stocked library. 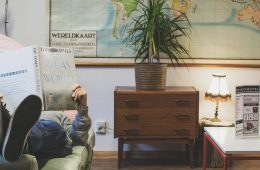 What about cheapest hostels in Buenos Aires? Also important: A safe location is key in Buenos Aires. Do not underestimate this! However, if you are traveling on a shoe-string budget and you wanna save every penny, there are ways to find the cheapest places in Buenos Aires. You can then filter by ratings too. Make sure you check as well for the ratings, especially for the very cheap hostels in Buenos Aires. We recommend to read the absolute worst and best comments. These reviews will give you a great insight on what to expect. 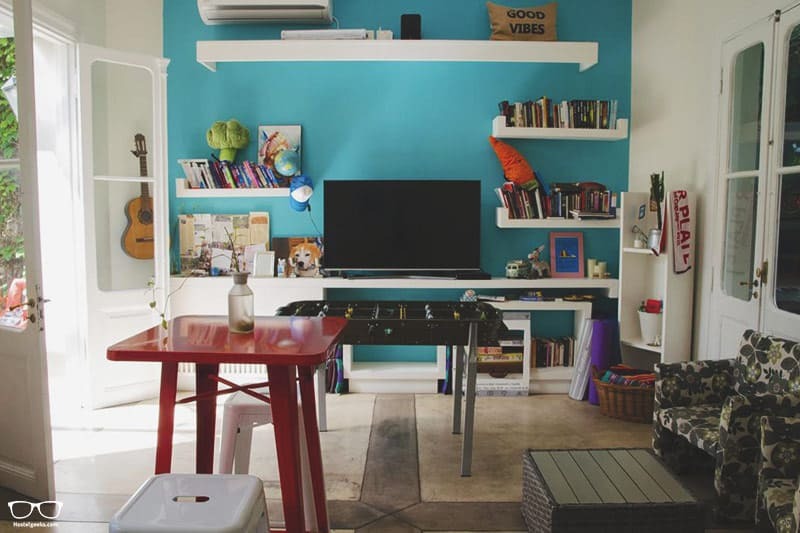 Yet again, we recommend going with these Buenos Aires hostels we highlight above. They are safe, clean, social; simply a great choice! Currently, we have no special hostel discounts in Buenos Aires. 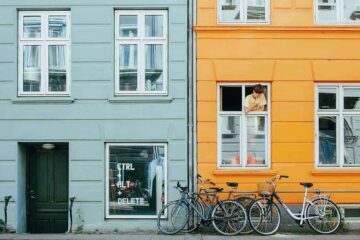 So for now you can subscribe to our newsletter to receive our newest hostel discounts always to your inbox. If you’re keen for even more you’ll love our guide to the 25 coolest things to do in Buenos Aires. 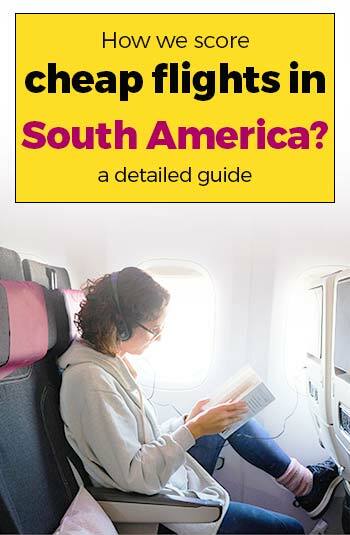 We enjoy Kiwi.com to find cheap flights all over South America including Buenos Aires, Lima and Cordoba. Alright alright. 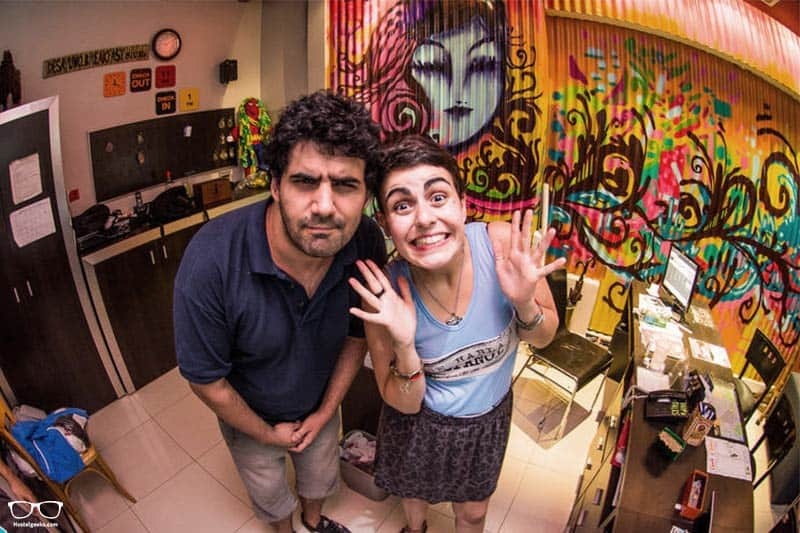 By now you have found your coolest hostel in Buenos Aires. Buenos Aires suddenly seems so much more attractive, right? By now, we hope you answered your question on where to stay in Buenos Aires. We hope you love our handpicked budget accommodations as much as we do! Then please please leave us a comment. This list of awesome Buenos Aires hostels should be as informative and useful as possible.